Cooper Firearms and the 20 VarTarg cartridge are featured in Varmint Hunter Magazine, a publication of the Varmint Hunters Association (VHA). Author Thomas Tabor recounts the fascinating history of Dan Cooper’s successful Montana-based company. Tabor then field-tests a Cooper Model 21 Montana Varminter chambered in 20 VarTarg. The 20 VarTarg is based on the 221 Fireball case necked-down to 20 caliber. 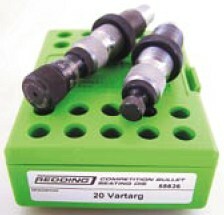 Invented in 1995 by Todd Kindler (of Small Caliber News), the VarTarg is an accurate and ultra-efficient cartridge. With just 18-19 grains of powder the VarTarg can drive a 32gr bullet at 3750 fps. Tabor visited the varmint fields to give the 20 VarTarg Cooper a real-world test: “As was expected, the 20 VarTarg was an exceptional performer on ground squirrels. Out to 250 yards both the cartridge and rifle were deadly accurate.” Tabor was impressed by the little VarTarg. He found that the VarTarg rivaled the larger .204 Ruger, while being kinder to barrels since the VarTarg burns much less powder. Overall, this article is a “must-read” for all Cooper Firearms fans. There are many interesting anecdotes about the early years of the company, and the author provides a wealth of useful info for anyone thinking about buying or building a 20-caliber varmint rifle. Share the post "Excellent Article on 20 Vartarg from Cooper Firearms"
I have always been impressed with the potential of this little cartridge. Because a friend has a full house Benchrest rifle in .20 PPC, I know that the 40 grain Bergers are good enough for competition. It is too bad that the author of the VHA article did his accuracy testing from a plastic rest adjusted near the top of its range. I would imagine that a better setup would have given better results. Sir: I am trying to form 20 VT brass on a new Forster CoAx press and want to know where to find SAAMI specs on the brass case. I mainly need to know the measurement from the base of the case to the datum line. I would appreciate any info you have on these specs or where I can find them. Can’t find anything online or in the latest Hornady Handbook (9th edition), and Todd Kindler won’t be back until May, 2016.